This vintage dairy cabinet really rises to the top! You just never know what you will come across during an antiquing adventure, and this find really rises to the top! I must say I felt like a “Dairy Queen” when I spotted this vintage dairy cabinet while walking the busy aisles of the recent Boston Antiques and Design Show and Sale. (If you missed that show, no need to cry over spilled milk… the next big event takes place April 24th and 25th at the Concord Armory in Concord MA. Click here for details!) Without further delay, let’s take a closer look at this cabinet and the delicious history behind it. 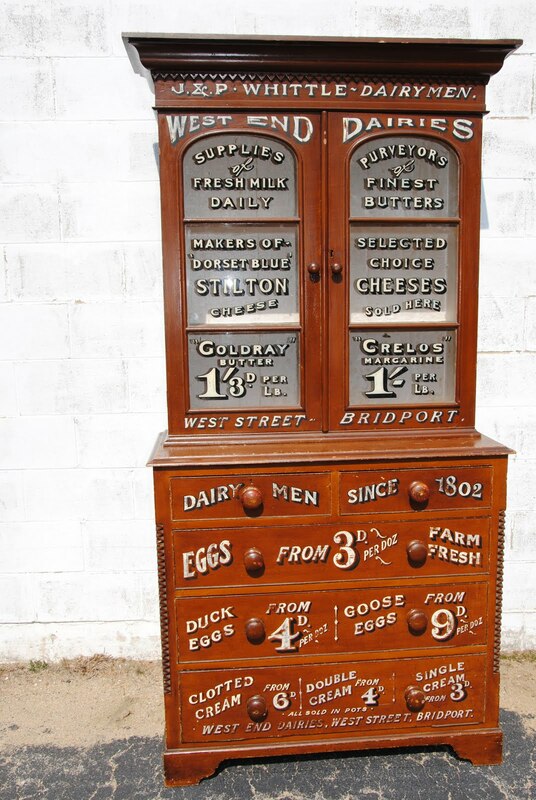 What we have here is an original 19th century dairy cabinet from Bridport, a small market town located in the south of England in Dorset County. This remarkable piece is made from solid wood and glass and measures is 42 inches wide by 18 inches deep by 83 inches high. The unit has five drawers and a large front display area protected by window doors. It has wonderful period trim and detailing. All the hardware and decorations are original. 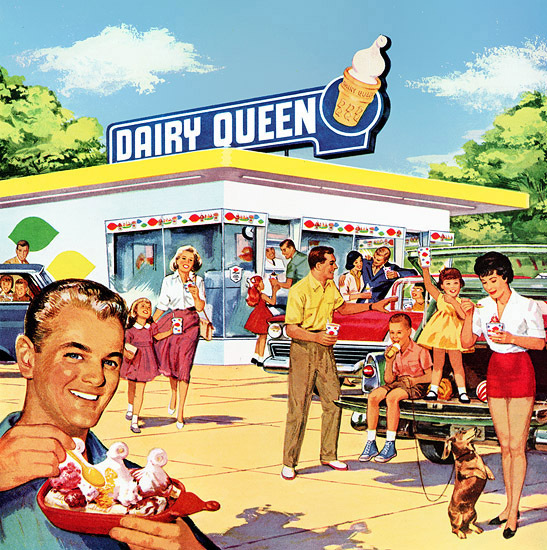 The cabinet was used to hold and store dairy products in a public marketplace; the painting on the windows and drawers advertised all the items for sale. It is very interesting to see what J&P Whittle, owners of the West End Dairies, had for sale in the late 1800’s. 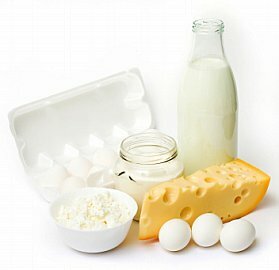 Some items, like milk, butter, margarine, and chicken eggs, are quite familiar to most Americans. Others, like duck eggs, goose eggs, and various types of creams seem truly from a different time and place. The prices are listed in “pence”; there are 100 pence per pound. For reference, most “typical” jobs for men paid roughly between 60 and 100 pounds per year in 1891. The one item listed on the case that really caught my eye was “Dorset Blue” Stilton cheese. Stilton cheese is a traditional dairy product made from cow’s milk; it tends to be semi-soft, crumbly, and has a strong odor to it. Its distinctive blue veins are created by piercing the outer layer of the cheese with stainless steel needles to add air during the ripening process. Stilton cheese in England was, and remains, a very big deal. This cheese was discovered and became popular in England in the mid 1700’s. Today, it is one of only seventeen British products given the status of “protected designation of origin” by the European Commission. And what does that mean? Since 1996, only cheeses produced in a specific way in three central English counties may be called “Stilton.” Apparently, over 100 years ago West End Dairies had their very own take on Stilton cheese and thus named their product after their own county. Legally, they would not be able to do so today. I would like to thank Kim Kassner of The Brewster Shop in Orleans, Massachusetts for whetting all our appetites over this really special vintage dairy case. 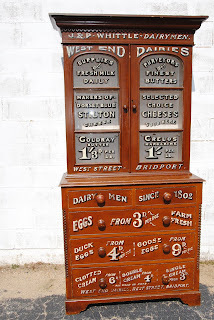 Posted in Featured Antiques Don't Use | Comments Off on This vintage dairy cabinet really rises to the top!